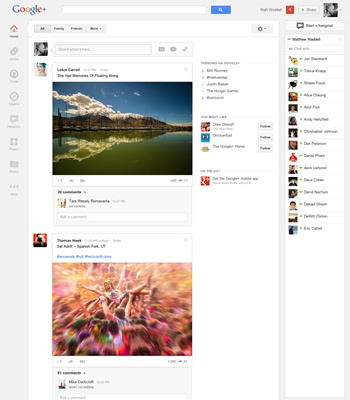 If you've logged into Google+ today, you may have noticed some big changes. On Google's official blog, the maestro of search has outlined those changes, which include a thorough user interface revamp. These alterations, the company hopes, will make the social service simpler, more beautiful, more functional and more flexible. Google says the update will be rolling out for "the next few days", but a few hundred thousand accounts had already taken on the modifications as of this morning. With the revamp comes a fresh look with a focus on apps. There is now a customizable navigation side "ribbon" which displays your apps. The ribbon has been designed with future changes in mind, according to Google. It also supports drag 'n drop for reordering your app icons to taste. For items on the ribbon that have additional features, context-sensitive menus will slide out as you mouse over them, giving users quick access to commonly used features. In the ribbon, Google has also added an "Explore" icon for viewing public interests and network trends. Users with ample screen real estate will now notice a wider browser window reveals an easy way to message or "hangout" with other Google+ buddies. The service's instant communication features persistently (and conveniently) appear on the left side of the window. The data stream has been changed significantly. Google is touting full-bleed media and conversation "cards" that make it easier to identify and join in on discussions. In addition, they've added a clever "activity drawer" -- a panel that users can slide out to reveal who's been paricipating in an particular item in their stream. One of the more curious features is a slider which adjusts how much stuff is actually shown in a user's stream. There's an independent slider for each Circle a user has. If someone has a lot of chatty friends they don't care about but would still like to hear what family members are discussing, then that user can adjust the "Friends" slider to minimize updates from that circle. That user can also maximize the "Family" slider to make sure he or she doesn't miss out on anything from relatives.